The Joyeux Noël resource pack by La Jolie Ronde contains all you'll ever need for Christmas! 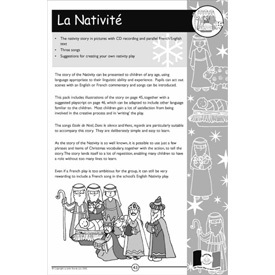 There's a Nativity play, Christmas stories, songs and activities in French, all of which are easy to learn and easy to teach. Perfect for Christmas activities in your school or at home. The resource book includes teacher's notes, photocopiable activity sheets and lots of ideas for games and activities to do at Christmas. 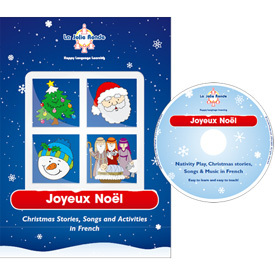 The accompanying audio CD includes a nativity play, Christmas stories, songs and music in French, and provides lovely alternative songs to sing at this happy time of the year. This pack is great for children aged 5 - 11 from beginner to more advanced. 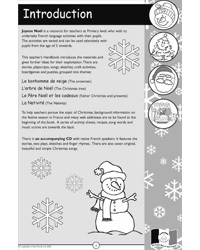 Click on the image below to download sample pages from Joyeux Noël. Somewhat disappointed. Would have preferred more craft activities. Few nice finger rhymes etc but a lot of the material is too involved and complicated. Would not have bought it if had been able to see it personally. A shame, as I have used other Jolie Ronde materials.